FAQ | Trailer. Set. Go! Let us help resolve your questions and concerns. If our Frequently Asked Questions pages does not resolve your question or concern, please contact us and will do our best to answer you. Monday through Friday typically ship the same day or next business day they are placed. Orders placed after or during holidays and weekends will be processed on the next regular business day. We work with all major shipping companies. Depending on the size of your order, they may go through UPS or FedEx Ground or the United States Postal Office. You will be updated with tracking information via email when your order has been prepared for shipment. Please allow 24 hours for tracking numbers to activate. Tracking numbers are active once the packages are scanned into their system at time of pick up. When you receive your tracking information, you can utilize this map to determine your estimated delivery day. Please note that transit days do not include holidays or weekends. Can I have my order shipped somewhere outside of the contiguous 48 states? Yes, we can! Please contact us for a custom shipping quote at 855-262-4361 or gosales@trailersetgo.com. 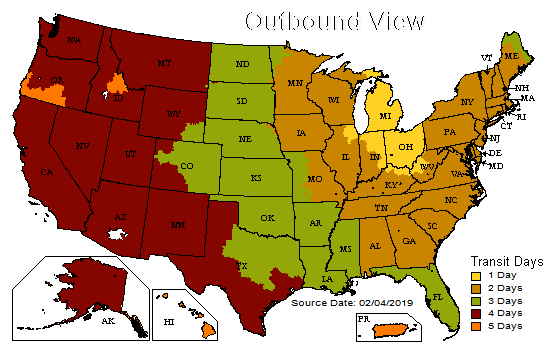 Additional charges may apply for shipping outside of the contiguous 48 states. The customer will be responsible for any customs and tariffs. What’s the proper inflation of Special Trailer Tires? Trailer tire pressures should be checked “cold” (before you start out each day) and be inflated to the maximum air pressure listed on the tire's sidewall. The sidewall will show the maximum weight that can be carried on each tire when inflated to the maximum air pressure. Air pressure will change as the Load Range of the tire changes as well. For example, the ST205/75R15 Load Range “C” tire is rated at 1,820 pounds of carrying capacity at 50 PSI while the same tire in the Load Range “D” tire is rated at 2,150 pounds of carrying capacity at 65 PSI. Trailer tires perform best at the maximum air pressure while giving you the best fuel economy as well as the best tire wear. If you do not inflate your tires to the maximum air pressure, the load capacity and longevity of the tire is reduced. Underinflation and/or overloading can cause pre-mature tire wear and failure. What are the torque specifications for my wheels? 13 inch through 16 in six bolt wheels – Torque to 100-120 foot pounds. 16 inch and 17.5 inch eight bolt wheels with ½ inch studs – Torque to 100-120 foot pounds. All 9/16 inch wheel studs using a coned lug nut (16 inch and 17.5 inch 8 bolt wheels) -- Torque to 120-140 foot pounds. 5/8 inch flanged lug nuts with rotating flange on steel wheels – Torque to 190-210 foot pounds. 5/8 inch flanged lug nuts with non-rotating flange on steel wheels – Torque to 275-325 foot pounds. Tighten lug nuts in a star pattern using a torque wrench. Re-torque wheel nuts after 10, 25 and 50 miles. Check periodically thereafter. Failure to follow these instructions may result in wheel loss, which can cause injury or death. What is the speed rating of ST tires? Special Trailer tires have a maximum speed rating, just like passenger car and truck tires. The speed rating letter is normally after the load index on the sidewall. If you do not find a speed rating letter, the speed rating is 65 mph. 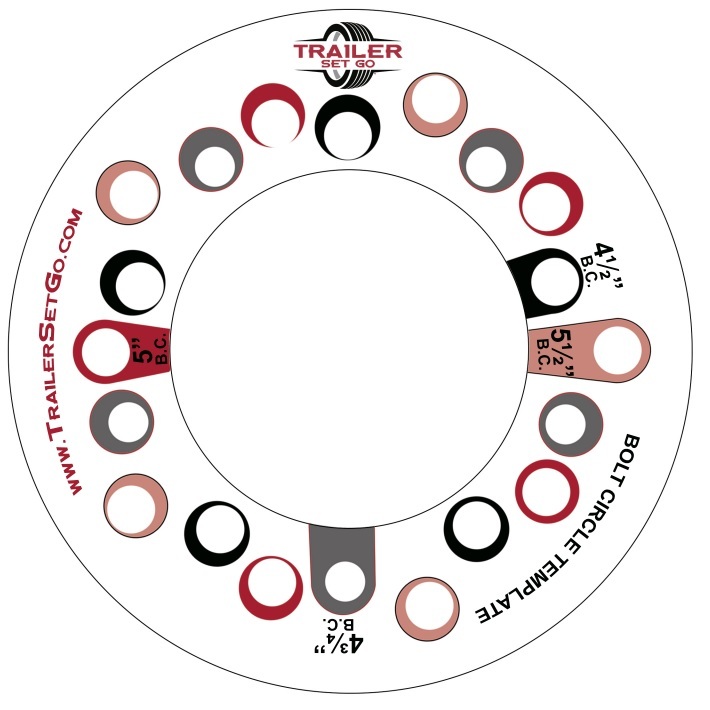 Most Special Trailer tires manufactured in 2015 and later should have a speed rating code on the sidewall next to the load index number. The three speed ratings listed below are the most common for the Special Trailer tires. However, if it has any other letter to designate the speed, please follow it. All warranties start at time of purchase. The manufacturing week and year is stamped into the sidewall of the tire. Locate the DOT number on the sidewall of the tire near the bead area. There will be a series of letters and numbers after the DOT that indicate the code for the manufacturing plant and size of the tire in code. Following the factory code, there are four numbers on the sidewall of each trailer tire that are normally in an oval outline. The first two represent the week and the second two represent the year. For instance, if your tire says 0917, it was made in the ninth week of 2017. Most trailer tires should be replaced every 5-6 service years even if the tread life is not completely used. All tires are stored within climate-controlled warehouses. What is the difference between bias and radial tires? Which one should I order? The main difference between a radial trailer tire and a bias ply trailer tire is the way each tire is constructed and the materials used in the construction. Radial Tire – A radial tire has a series of cord plies that are typically arranged at a 90-degree angle to the direction of tire travel. These plies of cord give the tire it's reinforcement to be able to withstand the internal air pressure and external weight of the trailer and its load. The network of cords that give the tire its strength is called a Carcass. Commonly used materials for the cords are polyester, steel, and other textile materials, embedded with a layer of tire rubber. The tire is then wrapped with additional belts made of steel. Additionally, an overlay made from polyester or aramid fibers may be added to the belt package for added structure. Bias-Ply / Cross Ply Tire - A Bias-Ply tire's body utilizes ply cords that extend diagonally from bead to bead. Typically laid on a 32 to 60-degree angle with successive plies set on opposing angles to form a crisscross pattern. It is on top of these layers that the tread is applied. The ply layers generally consist of polyester, fiberglass, or steel cords embedded into the rubber itself. Which one should I order? The Special Trailer (ST) tires are designed specifically for towing applications. Special Trailer Radial tires have a consistent footprint on the road, giving it better ground contact and stability while providing a smoother ride and better tread wear than the bias ply tire. Additionally, a radial tire will run cooler than the bias ply tire which also helps extend the life to the radial tires. The Special Trailer Bias ply tires normally have more layers in their sidewalls than a radial tire. These added layers may be more robust to punctures and scuffing than the radial tires in off road or farm use applications. Most 8-12 inch tires are bias ply tires. Both the radial and bias ply tires will provide great service if you maintain proper air pressure and move the tires once every 30 days. Should I have my tires balanced? What method do you use to balance tires? All custom assemblies come balanced for complete customer satisfaction. While balancing is not required, it will help extend the life of your tires as well as control vibration throughout your suspension, trailer components (cabinets, appliances, etc. ), and cargo on the trailer. It will also help to keep vibration from transferring from the trailer to the tow vehicle. We have the equipment to balance anywhere from 10-inch to 19.5-inch tires and wheels. If you are ordering 10-inch or 12-inch assemblies and wish to have your tires balanced, please select the balance option at time of ordering. GoPack assemblies are not balanced so we can offer you the best entry level price for when you need a tire and steel wheel ASAP! What Method do you use to balance tires? Most trailer wheels are lug-centric, meaning they are centered on the hub with the lug nuts, and not the center bore of the wheel. Because of this, we balance with a pin plate adaptor that mimics the way your tire and wheel assembly will be mounted on your trailer. This gives superior accuracy compared to a hub-centered balancer. How do I measure my bolt pattern? Please refer to this visual and let us know if you need further clarification. Odd bolt patterns are most common among 5 Lug wheels, so please make sure you measure and order correctly. How do I know if my trailer wheels have an offset? Review the stamping information on the wheel. Some wheel manufactures will have the offset marked with the wording “ET” followed by a number. ET0 is a zero-offset wheel. Most trailer wheels have a zero-offset, but there are some that do not. When in doubt, to accurately measure the offset, the wheel will need to be removed from the trailer. The offset can be measured with or without the tire on the wheel. With the wheel laying on a flat surface with the valve stem facing up, measure from the flat surface to the back side of the mounting flange. Then flip the wheel over and measure from the flat surface to the top of the mounting flange. If these two measurements are the same or within 1/8” the wheel will be considered a “0” offset. If the measurement with the valve stem up is greater than the measurement with the valve stem down (more rim is to the inside of the center disc) it is considered to have positive offset. If the measurement with the valve stem up is less than the measurement with the valve stem down (more rim is to the outside of the center disc) it is considered to have negative offset. Please feel free to contact us if you need further clarification. How should I take care of my Steel Wheels? Steel wheels may be painted, galvanized, or electrically coated. When cleaning steel wheels, only use mild soap and water. Use of harsh cleaners, abrasive brushes or course towels may result in damage to the finish and is not covered under warranty. How should I take care of my Aluminum Wheels? All of the aluminum wheels we carry except Alcoa have a clear coat finish. When cleaning aluminum wheels, only use mild soap and water. Use of harsh cleaners, abrasive brushes or course towels may result in damage to the clear coat finish and is not covered under warranty. How will my credit card be charged?